A comprehensive set of Hubble Space Telescope (HST) observations of Comet ISON has been approved, with some early programs already executed. 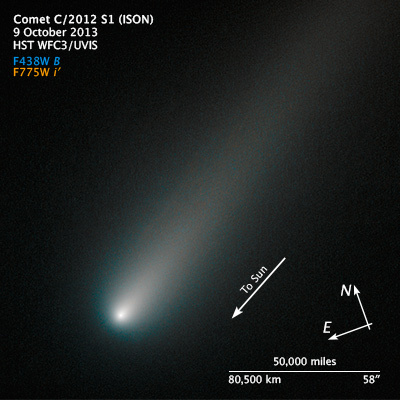 On July 16, 2013 the STScI Office of Public Outreach released a blog (hubblesite.org/go/ison to gather inf ormation about HST observations of Comet ISON together. Hubble Heritage program 13229 imaged the comet on 8 May 2013, using a Wide Field Camera 3 (WFC3) subarray which is half of one of the two CCDs (2K x 2K subarray). Eight identical 171-second exposures were obtained, with one dither step to mitigate bad pixels. The long-pass F350LP filter was used to maximize the signal-to-noise in one orbit. A small offset from the nominal aperture was applied to optimally position the comet and tail within the field of view. Another orbit on 30 April 2013 obtained deep fixed-pointing images of a field with Comet ISON in it, released July 16, 2013. 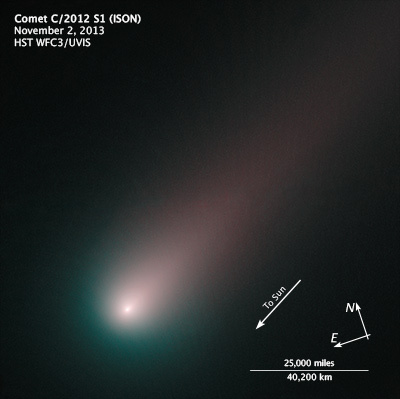 Further details about the Heritage Comet ISON observing program are contained in the Phase II observing program.